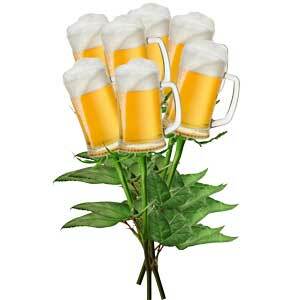 Contrary to what Anheuser-Busch tried to prove, you’re probably smart enough to know beer isn’t sold by the stem. The Chinese New Year has officially started and it’s the Year of the Horse. Being the Year of the Horse, it was great to see Budweiser’s iconic Clydesdale horses with puppies for its Super Bowl ad with #BestBuds. The people who measure the favorability of Super Bowl ads has ranked this one as one of the best this year. Emotionally it links the Budweiser brand with happy memories and love. I think it would be safe to say that beer and love have played a big role in a lot of Valentine’s memories (they may not necessarily all be happy, but I’m sure they were memorable.) Beer and love also reminds me of the time where Anheuser-Busch tried to make some very unhappy memories with 300 florists in Ohio by suing them in 1983. Strangely enough, 1983 was also the 50th Anniversary of the Clydesdale Horses for Anheuser-Busch. Click here to relive the 1983 commercial commemorating the occasion. Anheuser-Busch, Incorporated (“A–B”) is the well-known brewer of Budweiser beer, having adopted and used the trademark BUDWEISER for beer for over a century. A–B is the owner of U.S. Trademark Registrations for the mark “BUDWEISER” for beer and malt liquor and for the mark “BUD” for beer. Sometime prior to 1979 A–B adopted the slogan “THIS BUD’S FOR YOU” in connection with the sale of beer with a pending trademark application for beer at the time the case was decided in 1984. A–B expended substantial sums of money, time and effort in the advertising and promotion of beer under the marks “BUDWEISER”, “BUD” and “THIS BUD’S FOR YOU”, and the slogans have become well-known. A–B also developed a multimillion dollar trademark and brand name licensing program, using “BUD”, “BUDWEISER” and “THIS BUD’S FOR YOU” in promoting the sale of nearly every kind of conceivable product from t-shirts to tote bags. A–B’s licensees render royalty reports and payments on a quarterly basis to A–B in accordance with their license agreements. In August of 1984 there were some 290 active licensees whose merchandise included various decorative accessories, giftware, paper goods, clothing, housewares, sporting goods, artworks, novelties, desk accessories, toys, games, jewelry and luggage. Annual revenues generated at the wholesale level have been in excess of $20 million annually since 1982, with retail sales in excess of $40 million. A–B’s licensing royalty revenues for 1983 were in excess of $570,000 and were expected to exceed $650,000 for 1984. By the way, “Sweetest Week” occurs in Ohio and provides an opportunity for those who have been remiss on Valentine’s Day, Mother’s Day, Father’s Day, or various and sundry birthdays, to make up for their omissions in one week. The Sweetest Week campaign featured advertising in Cleveland’s daily newspaper, television commercials, banners placed in the windows of retail florists, and a contest. Budweiser alleged trademark infringement, invasion of commercial rights, deceptive advertising, and unfair competition against the Florists for their marketing campaign. What is Trademark Infringement without a License? The defendant’s (Florists’) use is likely to cause consumer confusion. NOTE: The actual 1983 case analysis is older law and much more detailed. I’ve condensed it down significantly for ease of understanding and to make it more contemporary. If you would like to know more about your rights, always seek the advice of a lawyer to know your current laws! What products they believed were sold by the business that sponsored or promoted the advertisement. That when the phrase is used in connection with floral promotion, it is perceived by a significant number of people to be sponsored by BUDWEISER or Anheuser-Busch, specifically 54% of the television viewers, and 14% of the newspaper readers. The Court concluded the survey established the slogan is, indeed, a famous mark. A careful reading of the survey’s findings indicated that by far the larger percentage of interviewees realized that the Florists’ ads were for flowers, not beer. The Court ruled: It is absurd to believe that any consumer could confuse beer with flowers, even of the underdeveloped variety [such as a bud]. A–B did not suffer a loss of beer sales as a result of the Florists’ use of its slogan. Although the Florists intended to capitalize on the slogan, there was no evidence Florists intended to deceive the public into believing that A–B was connected in any way with their fresh-cut flowers. Nor was there any evidence of actual confusion presented to the Court. No consumer called any florist asking to be delivered a six-pack; nor did any consumer call A–B seeking to purchase two dozen roses. The marketing channels for the products are totally different. The Florists, in selecting “THIS BUD’S FOR YOU,” did intend to capitalize on the familiarity of A–B’s slogan. But they did not intend to deceive consumers into believing that the fresh-cut flowers were in fact being marketed by A–B, or that they, the Florists, were marketing beer. Did this case cause you concern for your own branding? Your business brand can your company’s most valuable asset, as it can embody your reputation and distinguishes you from your competition. A well-protected brand can give you a significant competitive advantage in the marketplace and create important goodwill with your customers. What would you do if you found another business using your slogan without your permission? Did you know you have other options besides filing a law suit? Ask me about your six other options (and your other business legal questions) for FREE at our next Free Legal Forum on March 4, 2014. Seating is limited to so reserve your seat now! Click here to contact me for details.